Spring Passion turns to Summer LOVE and with it, a flurry of engagements and weddings! The atmosphere at Rona K Corp also starts to sizzle as we look forward to helping a suitor choose the perfect engagement ring for a special love, or the happy couple design one together as well as custom wedding bands. A helpless romantic, this is one of my favorite parts of being a jewelry designer. With so many creative ways to display diamonds & gems in precious metals ranging from palladium & platinum to 18k and 14k white gold, rose gold, yellow gold, and two-tone gold, the options are endless. You already know that June is a popular month to “pop the question” and get married. But did you ever wonder how the “diamond” became the gem of choice for engagement and wedding rings? The Old Farmer’s Almanac says the tradition took hold when Archduke Maximilian of Austria presented a diamond to Mary of Burgundy in 1477. Of course, Marilyn Monroe’s declaration that “Diamonds are a Girl’s Best Friend” certainly hasn’t hurt its sparkling reputation! These days, the majority of brides receive diamond engagement rings, but colored gemstones are growing in popularity. Take Kate Middleton’s acceptance of Princess Diana’s blue sapphire engagement ring from Prince William as an example. The meaning behind the sapphire is said to be a pledge of love & devotion; a ruby engagement ring, safety, love, passion and courage; and the green emerald, luck, good fortune and youth. Of course, the diamond is considered by many the ultimate expression of “true love” but for many women, it’s value has long been considered a symbol of security. Whether you choose a diamond or colored gemstone for your true love’s engagement ring, the setting and overall appearance are also important. I believe when two people come together to become ONE in marriage, a new and truly unique entity is formed. 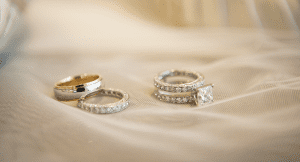 Without a doubt, no couple is the same, and that’s why, at Rona K. Corp, we create engagement and wedding rings designed to celebrate each distinct relationship. From beautiful diamond solitaires to halo, petite, semi-mount, fancy, antique and three stone settings(not to mention our engraved collection) plus, a wide array of sapphires, rubies, emeralds and other colored gemstones, we have everything necessary to create custom engagement and wedding rings that truly reflect “your love.” Be inspired when you click on “Engagement Rings & Wedding Bands” on the home page; and congratulations on your decision to “tie the knot!” May your marriage be blessed with joy and prosperity. Meet the “Rona” in Rona K Corp.
As Founder & President of Rona K. Corp, I am proud to share with you my inspiration for Engagement & Wedding Rings, The KID’S Collection, and my American Dream Story, which includes my children now entering the next generation of our family jewelers. We design and manufacture beautiful engagement rings, wedding bands, stunning necklaces, family charms and beautiful bracelets. Proud of the excellent reputation we’ve built since Rona K. Corp was established in 1973, we invite you to learn more about us and to read our customers reviews. What Dad Really Wants for Father’s Day – and Grandpa too! RKC KIDS – An Emotional Connection!